The Ōtautahi Community Housing Trust is the landlord of 2300 social housing units across Christchurch and Banks Peninsula owned by the Christchurch City Council. We put tenants at the centre of everything we do, and we are committed to ensuring our tenants have warmer, drier, healthier homes. In the interim, the Trust has looked for temporary solutions to improve insulation and warmth in our tenants’ homes. As a result, the Trust’s Warm and Well project commenced in April 2018. The project provides information to tenants on how to create a warm, healthy home and thanks to our Christchurch sponsors, we have provided 325 scoopys, 222 draught stoppers and bubble wrap to tenants free of charge. Community Energy Action (CEA) presented to tenants at 14 organised information sessions in May/June 2017. They spoke about the benefits of bubble wrap and other methods to assist with reducing condensation build up and improve the warmth of homes. CEA provided resources which informed and supported the commencement of the Trust’s Warm and Well Project in 2018. Bubble Wrap is a budget friendly way to insulate a chilly home while reducing power costs. 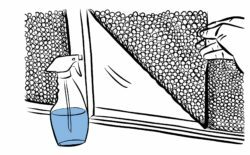 It can be fitted immediately, and it helps reduce condensation build up and heat loss by creating an air gap between the glass and the plastic to stop warm air from escaping. It is a cheap, effective insulation option that can be used in the short or longer term. It is up to tenants to choose if they wish to apply the bubble wrap. The Trust does not use contractors to install bubble wrap as placing bubble wrap on the windows is very easy to do. Tenants can ask their Tenancy Manager to assist with the process. Bubble wrap as an insulator where double glazing is not installed, is a temporary solution. Where a tenant, at their own cost, requests to install alternative heating in their home, such as a heat pump, the Trust will forward the request to the Christchurch City Council for their consideration and approval as the asset owner. In most instances, the Trust will support such requests from tenants. As always, we encourage any tenants that have issues to call us on our 24-hour number 0800624456. Tenants can also request a copy of “The Healthy Home Guide” which has a range of tips for helping to keep your home warm and dry.